The first thing that came to mind when I saw this topic was a terror called MDP. This was when I had joined a British company as a Management Trainee and my training started off with learning all about the office administration side of branch management. At each desk, I had to first read the MDP which expanded meant Manual of Depot Procedures, then observe what the clerk did. The next step was to work under his/her supervision, then work independently before rounding off with a report on what I had learnt. I made the mistake of showing some enthusiasm being the very first MBA taken on as a Trainee by making some suggestions in my first three reports. Much to my horror, after they were read by the Divisional Manager, I was asked to report to him. He formally complimented and congratulated me on my suggestions and gave me an additional responsibility of completely overhauling the MDP before I completed my training as he felt that it was badly in need of updating. Quite how I passed through that ordeal is a memory that came back and I would rather forget that. Simply stated, there was resistance to change and resentment from well entrenched bureaucracy which did everything possible to scuttle my study of procedures. I don’t know if such things happen now to fresh Management Trainees, but if they did, my heart goes out to them. Coming to more recent times, the most frustrating new rules that I have experienced have all to do with change to traffic rules, primarily changing roads and lanes into one way to accommodate increased vehicle population and traffic. Closely related to and implemented with great vigor are the new No Parking rules. 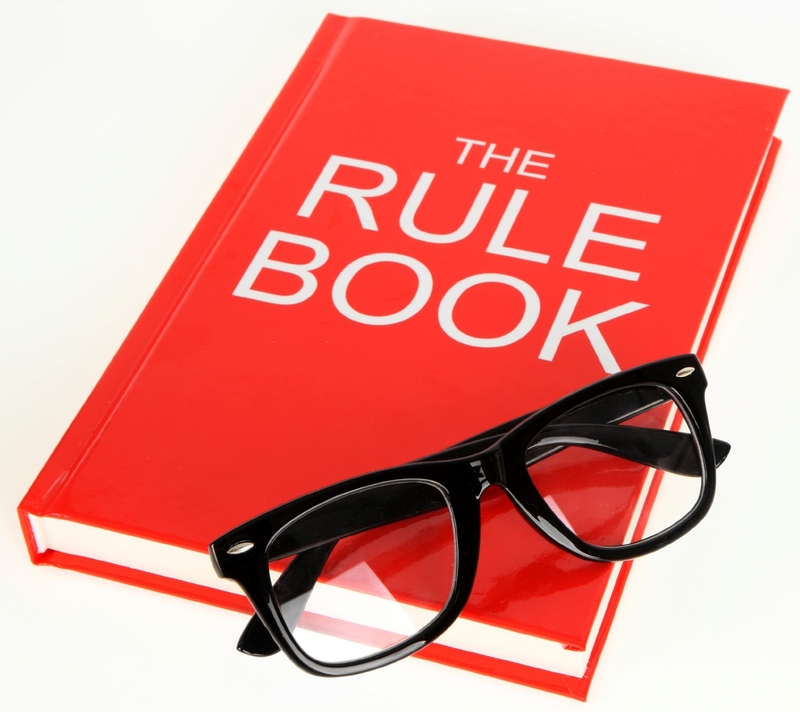 In personal lives, new rules start to operate when someone elder either moves in and / or dies or a newcomer like a daughter in law or a pet arrives to complicate simple lives, as all such things happened in my life during the last few years. On health matters, new rules on how to sit, walk, sleep etc are all advised when joints are replaced or revised like when it happened to my hips. I have also experienced voluntarily accepting new rules of waking up time, eating time, sleeping time etc when I had gone on meditation retreats as well rules on diets and habits during the retreats. Luckily, I have not had to accept constantly changing rules of conduct / behaviour etc in corporate environments for a long long time. I am told by young job hoppers that this is quite bothersome. And I can sympathise with them. 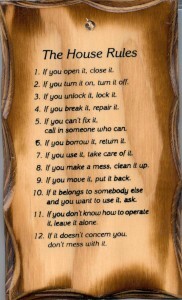 I don’t have this framed and hung on any wall in my home, but this about sums up the rules that I would like to see observed in my home. By and large they are. Please click on the image to get a larger resolution. This topic was suggested by Shackman, for the weekly Friday Loose Bloggers Consortium where currently nine of us write on the same topic every Friday. I hope that you enjoyed my contribution to that effort. The seven other bloggers who write regularly are, in alphabetical order, Ashok, gaelikaa, Lin, Maxi, Padmum, Pravin, Shackman and The Old Fossil. Do drop in on their blogs and see what their take is on this week’s topic. Since some of them may post late, or not at all this week, do give some allowance for that too! This entry was posted in Blogging, Family, Management, Medicine, Relationships, Writing and tagged Management Training, MBA, Meditation retreats, Office administration. Bookmark the permalink. 21 Responses to New Rules. 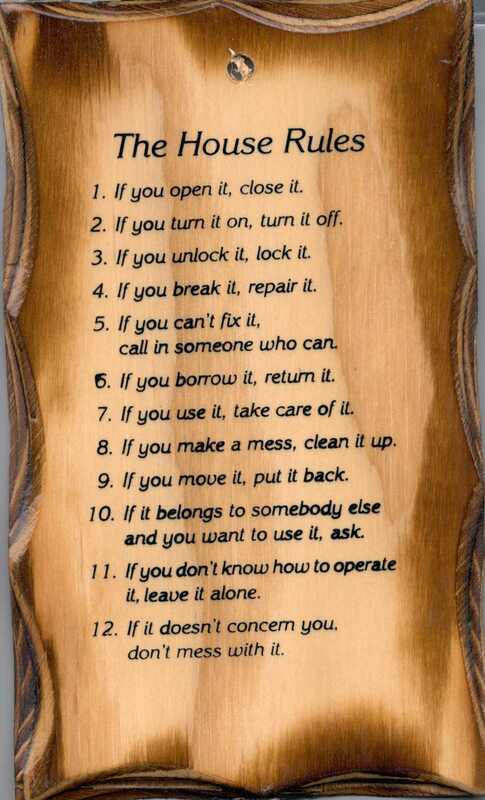 All those rules, if broken are very expensive here and if yo argue, can get to me more so! To add insult to injury, if you break a rule, they say that “ignorance of the law is no excuse.” I think I could prove that it is; I need a photo of the interior of any decent law library, and a psychologist to testify that we are neither psychic nor all blessed with eidetic memories. Yes indeed. As I write this I am reminded of Rasheed’s disappearing van! “Hell, there are no rules here – we’re trying to accomplish something”. I wish that we could have more spaces like that! Rules 9 and 12 are the winners — thankfully, they are observed well in my castle ! Absolutely no question that these two are the best. I love the house rules. I must make a copy for the benefit of any future visitors! Rules can be very annoying if they make my everyday life more difficult, even if I can see the point of them and fully realise that life without any rules at all would be anarchy. The rules that really bug me are those that are based entirely on tradition and ritual and seem to have no useful purpose at all (like all the bizarre procedures at the State Opening of Parliament). Rules on ceremonies can be stupid. Here is a story that we tell to our children. following all the prescribed rites and sacred rituals. cat followed his master wherever he went. the sacred tree every time he performed his ‘puja’. perform my ‘puja’?” He thought and prayed about it. At last he found a solution. start his ‘puja’ in keeping with all the customary rites and rubrics of the sacrifice. The rules in that list are good ones, but I am notoriously bad at following rules. Even my own rules. They are the most difficult ones to follow! I can go along with most of the rules, but the curious cat part of me has troubles with rule number 12. Modify it. And please read my story about the cat at puja time. I don’t think about rules very much, but tonight I found out our local paper — not very good and very expensive — is now only going to printed 3 days a week instead of 5, and it will no longer be delivered but sent by mail. They say they will be still producing “quality news” that hasn’t happened in a long time!) but a lot of it will be online rather than print, which doesn’t do Andy any good. Last March we renewed our subscription for two years and are wondering if we can get our money back since the “rules”/expectations changed after 40 years. Andy says he’ll try the new system first before he decides what to do. It should be interesting. That kind of breaking of rules can be very off putting. I fume when the local papers drop the crossword puzzle when they have surfeit of advertisements. i like those house rules. i imagine so few follow them in most households! there are pros and cons in living with loved ones. i think i could never live with the marine. we are both now old bachelors too set in our ways! living alone means changes come usually from the outside in various ways. from what i have seen of traffic where you are… i think maybe one way streets might be wise in the long run! I am trying to get away to live on my own in an assisted living community. Who knows, this time next year, I may just be doing that.